Through 2021, global demand for construction machinery will increase 9.6% annually to $250 billion. The Asia/Pacific region, led by China, will register double-digit demand gains after declining during the 2011-2016 period. Sales of dozers and off-highway trucks will climb at an above average rate through 2021 because demand for these products fell at fast pace between 2011 and 2016. Excavators and loaders, which account for the largest single share of construction equipment demand worldwide in dollar terms, will post the largest value gains between 2016 and 2021. 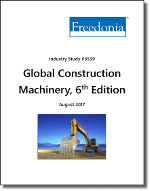 Construction machinery used in mining, energy, forestry, and other nontraditional applications (e.g., agriculture) is included in this study. The study covers both self-powered and non-self-powered machinery. However, handheld equipment, such as jackhammers, is excluded from the scope of this study. Also excluded from the scope of the study are certain products sometimes considered to be construction equipment, including aerial work platforms, dredging machinery, forklifts and telehandlers, industrial cranes, log splitters, pile driving equipment, and tunneling machinery. Used construction equipment of all types and sales of parts and attachments to new machinery OEMs are outside the scope of the study as well. Historical data for 2006, 2011, and 2016, and forecasts for 2021 are provided for demand by product type, total production, and net exports on a country-by-country basis in millions of current US dollars, including inflation. Also provided at the world level is construction machinery demand by product type in thousands of units.